Tools that can help you turn off gas, electric, and water and heat utilities. Practice earthquake drills. In a commercial area, invest on an emergency response training for your employees to minimize the risks and costs of damages. Bolt bookcases, latch cabinets or cupboards, nail down shifting furniture, and anchor heavy appliances. Construct extra support for your windows and doors. Store heavier objects close to or on the ground. Support the overall framework of your house. Store flammable liquids away from flame-inducing objects (stoves, furnaces). Fasten mirrors and heavy paintings (or whatever you have tacked up or supported on the walls) away from beds, couches, or wherever people are typically situated. Do it yourself or enlist the help of a professional: check for vulnerable foundations, cracked pipes, faulty or cracked walls, inadequate masonry, etc. Envision "safe spots" in every room. If an earthquake strikes, could you dart under that table, or that desk, or that doorway? Earthquakes are hard to predict. Even the sharpest of experts can’t reliably predict major earthquakes.They can, however, calculate probabilities passed on past patterns and science. Unusual weather patterns, especially concerning temperature. Ensure your home is as stable and secure as possible. Stabilize or isolate the heavy or hazardous materials in your home or workspace. Plan for an earthquake emergency with kits and drills. When an earthquake strikes: drop, seek cover, and hold on. 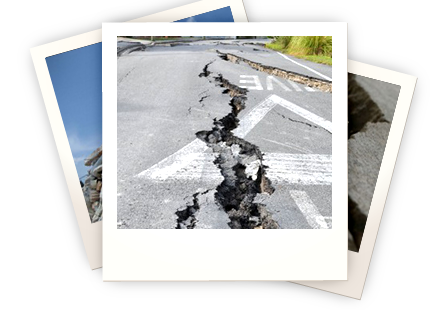 After an earthquake, assess your situation and don’t make sudden moves. If you become trapped by an earthquake, stay where you are and try to alert others so that they can reach you instead. If you’re in a car, slow down and pull over at a clear place, far from buildings, trees, and power cords. Move far from bridges and elevated highways, as these may give way. If you’re outdoors, drop to the ground at a similarly clear place. If you’re in bed, and relatively safe from flying or falling objects, stay put and guard your head and body with your pillow and blankets. In a high-rise building, stay away from windows. "Drop, cover, and hold on tight." Take cover beneath something sturdy that will protect you from flying, shattering objects. Crouch beneath a heavy table or desk. If it moves and you can’t keep it in place, go with it. Stay away from bookcases, wobbling furniture, glass, and exterior walls and doors. If possible, take cover within a doorframe, which is more stable and provides more support than any other place in the house. Only use a doorway which you know is load-bearing and strongly supported. If there’s nothing to protect you, crouch against an interior wall and cover your head with your arms. Don’t be alarmed; fire alarms and water sprinklers will probably go off during an earthquake. Don’t exit a building during an earthquake. You’re most vulnerable right outside of a building—you could easily be hit by debris that is plummeting from collapsing exterior walls. Know that most injuries occur when people attempt to run inside a building. Don’t move. At best, you’ll kick up dust (bad for your limited air supply); at worst, you might cause a further collapse. Cover your nose and mouth lightly with cloth. Shout—as a last resort. It’s dangerous, because you’ll inhale too much dust. Assess the situation; make sure it’s safe to move before you move. If possible, exit the building as soon as possible. If you’re home, tread carefully: inspect utilities, open cabinets carefully, clean up spills, and wear protective clothes so you won’t hurt yourself amongst the debris. If there’s a power outage, unplug appliances. If you smell or have any indication of a gas leak, evacuate immediately; open doors and windows on your way out. If water lines or sewage lines seem to be damaged, call a plumber before using the water and toilet utilities.